We’ve all left a movie humming the theme song. And we all have that one song that always takes us back to a specific movie – whether it was written specifically for the movie or not, the song and the movie are inextricably linked. Whether it’s the anxiety-inducing spiraling dissonance of the “Vertigo” soundtrack, a dance-happy hit like “Footloose” or even a cheesy ballad like Whitney Houston’s “I Will Always Love You” from “The Bodyguard” (the biggest-selling movie soundtrack ever), good movie music sets the scene, as it were – it adds to the emotion and experience of the movie, whether it’s an action film or a rom com. “Imagine the opening shark attack in ‘Jaws’ without John Williams’ ominous strings,” Lydia Hutchinson writes. (Bonus trivia: The two-note motif from “Jaws” was taken from the score for “The Creature from the Black Lagoon”). 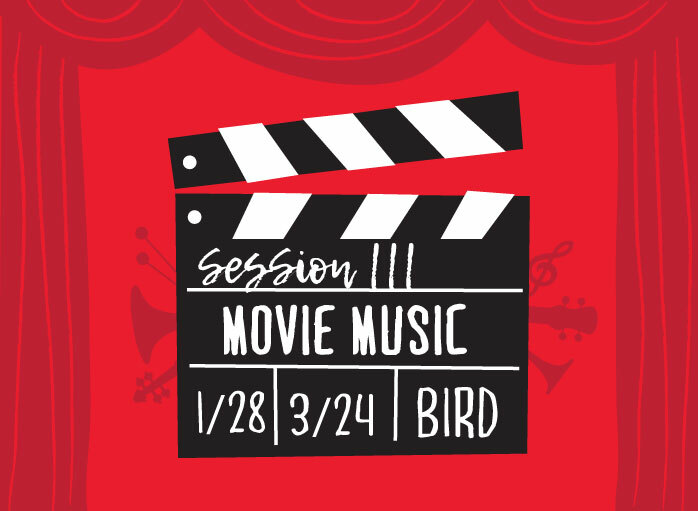 For this band session, we’ll be examining iconic movie songs and the emotions they evoke and putting our own spin on these familiar favorites.